HCM City (VNA) – The People’s Court of Ho Chi Minh City opened on March 17 the first instance trial on an asset embezzlement case at the Ben Thanh branch of the State-owned Vietnam Bank for Agriculture and Rural Development (Agribank). Nguyen Thi Hoang Oanh, former Director of Agribank Ben Thanh, was charged with embezzlement, bribery, and violation of lending regulations in credit institutions’ activities. Other defendants who are former staff members of Agribank Ben Thanh consist of Nguyen Quoc Viet (former deputy head of the Vien Dong transaction office), Cao Bao Hieu (former deputy head of the business planning section), Bui Cong Tien (former treasurer), Ho Dinh Thanh (former staff member of the business planning section). They were prosecuted for embezzling and violating lending regulations. Meanwhile, Huynh Ngoc Thach (former General Director of the Lien Luc Dia transport joint stock company) was accused of embezzlement. Le Van Tinh (Director of the Kim Gia Thuan Co. Ltd) was charged with swindling and bribing. 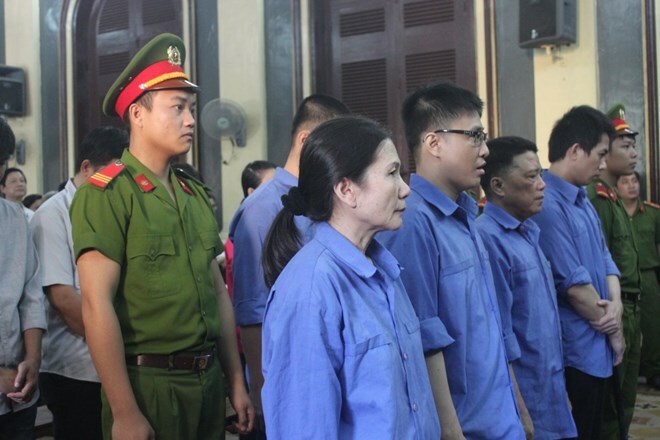 Four other defendants, namely Tran Truong Vu Son Quyen, Pham Dinh Kim Chi, Le Thi Hoa, and Huynh Thi Lan Phuong, were charged with swindling. According to the indictment, from August 2008 to 2012, Oanh and her brother-in-law Truong The Thanh, who was former head of the branch’s planning section and already died of illness, ordered staff members to make fake borrowing dossiers under the names of some people and legal entities so as to withdraw 2,660 taels (one tael weighs 37.5 grams) of gold, equivalent to over 47 billion VND (about 2.07 million USD), from Agribank Ben Thanh. When the debts were due, Oanh instructed Thanh and employees in coordination with the Lien Luc Dia company to use the names of other persons and businesses to sign contracts to borrow more money and gold from Agribank Ben Thanh to pay the old debt. As of 2012 – when an official investigation into the case was launched, the total value of loans plus interest that Oanh took out at the branch came to more than 34 billion VND (about 1.5 million USD). Oanh also took a bribe of 24 billion VND (1.05 million USD) offered by Le Van Tinh to help Tinh borrow gold from Agribank Ben Thanh. Although Tinh’s dossier was ineligible, Oanh agreed to lend him but asked him to receive cash instead of gold. The branch lent Tinh 4,350 gold taels and 28 billion VND (equivalent to over 137 billion VND, or 6 million USD) on paper, but he received only more than 112 billion VND (4.9 million USD) in cash since the gold value was set lower than the real price by 2 million VND per tael. Tinh used the money to lend to other people at higher interest rates and invest in real estate, but failed to recover the money. To cover her violations, Oanh continued to order employees to lend him more money to repay the old debt. Tinh currently owes Agribank Ben Thanh more than 36 billion VND (1.58 million USD) and 5,600 gold taels, equivalent to 300 billion VND (13.2 million USD).